Is a One-State Solution Completely Implausible? Daniel Polisar, the Provost of the right-leaning Shalem College in Jerusalem, just published a report titled “What do the Palestinians Want?” (link below) in which he reviews Palestinian attitudes about Israel and Jews. Israeli polls show the mirror image of Israeli Jewish attitudes about Palestinians. Meta-surveys suggest that Palestinians don’t think highly of Israelis and Jews, and Israeli Jews don’t have much sympathy for Palestinians. Alarmed by the Polisar report, I sent it to Noah Efron, the host of TLV1’s “The Promised Podcast” based in Tel Aviv, and suggested that they discuss it on a segment. They obliged, and Noah and his colleagues, Dan Futterman, the head of the Moriah Fund, and Bradley Burston, an Haaretz Journalist (and incidentally, an old friend from my college years at UC Berkeley) addressed the issue in today’s (November 12) broadcast. They discussed, among other things, the agenda of the author of the report, the credibility of the figures, the meaning of the surveys, and what political implications they might augur for the future. It ought to be kept in mind as you read and listen that Israelis and Palestinians have lived in stressful times ever since the Rabin assassination twenty years ago. Polls taken during times of violence and heightened anxiety are likely to measure more extreme attitudes than might be the case during more peaceful times. Additionally, the vast majority of the Palestinian population and much of the Israeli Jewish population are under the age of 25 years, and thus have never known times of quiet and peace, so the possibility of co-existence is foreign. Both Polisar’s article and “The Promised Podcast” are worthy of our attention. Sarah calls upon all Israeli minorities to join together and publicly express their support for their democratic state of Israel. Kol hakavod to you, Sarah. The Jewish people needs more people like you to speak out. Tashiv suggests that one Jewish state might be called “Judaea” and include the Jerusalem area going south, the West Bank settlements, and the cities of Ashdod, Beersheva and Ashkelon. Its population would number approximately 3.4 million people and include all the occupied West Bank Palestinians. The other Jewish state might be called “Dan” and include Tel Aviv going north, Haifa, the Jezreel Valley, the Sea of Galilee, Rishon L’Tziyon, and Petach Tikvah, and total 4.9 million people including Israeli Arab citizens in the Galilee and elsewhere who have been loyal citizens of the state of Israel since 1948. In effect, there would be one state (“Dan”) that is secular, liberal, modern, and economically thriving living alongside another state (“Judaea”) that is ultra-Orthodox, halachic, nationalist, and poor. This splitting of the state of Israel in half, of course, will never happen because the IDF, the West Bank occupation, the thriving economy of the “Dan” sector, and classic Zionist ideology won’t allow it. It is ironic that PM Netanyahu, who set the conditions for the thriving hi-tech economy when he served as Finance Minister during the Ariel Sharon era, and Naftali Bennett, the head of the Jewish Home Party that represents religious nationalists and the settler movement and who is himself a successful hi-tech entrepreneur, are two of the principle leaders of the current government and would be the leaders of the right-wing nationalist halachic state of “Judaea.” It ought to be noted, as well, that the policies of then Finance Minister Netanyahu are responsible for the widening economic gap between the wealthy and poor of Israel and the diminishing and struggling Israeli middle class. Many Israelis from across the political, national and religious spectrum might welcome a separation because they feel that increasingly someone else is taking over their country and that Israeli culture is moving either too far to the ideological left or ideological right. Don Futterman, the head of the Moriah Fund and a regular participant on the “The Promised” broadcast, pointed to another serious and consequential fault-line in Israeli society that exacerbates current tensions. He noted that Israel’s economic stability and success has become overly dependent upon certain sectors, leaving the ultra-Orthodox and Arab communities (especially under-employed Arab women) behind. Both sectors need to be integrated more fully into the Israeli work force in order to move their families out of poverty and enhance Israel’s national security. Splitting Israel in half is neither possible nor desirable because it would mean our giving up on the Zionist dream of the Jewish people united in a Jewish, diverse, pluralistic and democratic state. The truth is that we are stuck with each other whether we like it or not, and we better learn to live together or the Zionist experiment will end up on the trash heap of Jewish history. Upon my return from Israel a week ago where I was a delegate of the Association of Reform Zionists of America (ARZA) at World Zionist Congress (WZC) in Jerusalem, I met with Israeli members of my community to discuss the WZC, my experience in Israel and their concerns and anxieties about their Israeli families and friends. J Street is a pro-Israel pro-peace organization based in Washington, D.C. that advocates before the American government a two-state for two-peoples diplomatic resolution of the Israeli-Palestinian conflict as the only way that Israel can continue to be a Jewish and democratic state and assure its security and future. Having just spent face to face time with the leadership of the Israel Movement for Progressive Judaism (IMPJ) in Jerusalem as partners with ARZENU (the world Reform Zionist movement) at the World Zionist Congress, I wanted to forward this message from Rabbi Gilad Kariv, the Executive Director of the Israeli Reform movement, in memory of the late Prime Minister Yitzhak Rabin. It has become so very clear that PM Rabin’s assassination was a destructive turning point in the quest for peace with the Palestinians, and though hopes for a settlement of the Israeli-Palestinian conflict are now low in the near-term, we cannot stop advocating for a two-state solution. 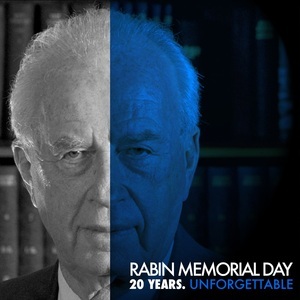 Rabin’s memory will forever be tied with hopes for mutual recognition and peace. Click here to view it in your browser. Our hearts bleed as we recall the fact that this heinous murder was supposedly committed in the name of the Torah. We condemn any attempt to hinder the democratic fabric in Israel in the name of our Jewish tradition… only in a truly democratic society which respects and defends human rights, will our timeless Jewish values be fulfilled; only the fortification and reinforcement of Israeli democracy will ensure the future of the Jewish people and all Israeli citizens, in their sovereign homeland. This month I will be attending the World Zionist Congress (WZC) meeting in Jerusalem (October 20-23) as a delegate of the Association of Reform Zionists of America (ARZA), representing 1.4 million American Reform Jews from 900 Reform synagogues and communities nationwide. Known as “The Parliament of the Jewish people” this will be the 37th meeting of the WZC since Theodor Herzl convened it for the first time in Basel, Switzerland in 1897. Though mandated by its constitution to meet every five years, for a number of reasons the WZC has not held elections since 2005, so this will be a meeting of some significance. Given the challenges and changes taking place in the Jewish world today, the WZC will meet in the wake of Secretary of State Kerry’s failed Middle East peace efforts and following successful negotiations between the P5+1 nations and Iran to stop Iran’s nuclear weapons program. In this upcoming WZC conference, 500 delegates representing the Jewish people world-wide will debate cutting-edge issues confronting the state of Israel and the Jewish people. The 500 delegates are chosen based on the following demographic formula: 38% are from Israel and are divided along Israeli political party lines as determined by the results of the last Israeli election earlier this year; 29% come from American Zionist organizations according to the last American Zionist Congress elections, also earlier this year, and the remaining 33% come from other countries of the Jewish Diaspora. The American delegation is composed of 145 delegates out of the total of 500: ARZA (Reform movement = 56), Mercaz (Conservative Movement = 25), Religious Zionists (Orthodox AMIT, B’nei Akiva and RZA = 24), American Forum for Israel (Russian speaking Jews = 10), HATIKVAH (Progressive Zionists = 8), Zionist Organization of America (far right-wing Zionists 7), Zionist Spring (7), World Sephardic Organization (4), Alliance for New Zionist Vision (2), Green Israel (1), and Herut North America (1). There is a natural alliance (though not yet formal) within the American delegation on many issues between ARZA (the largest vote-getter in the American Zionist election), Mercaz, HATIKVAH, and Green Israel for a majority of 87 of the 145 (60%). The Israeli delegation includes natural partners with ARZA and ARZENU (the international progressive/Reform Zionist movement) of representatives from the Labor-Zionist Union, Meretz, and Yesh Atid. Because ARZA was the largest vote-getter of the American delegation, we are in a position to chair a number of important committees and assure funding for projects benefiting Israel’s Reform movement (the Israel Movement for Progressive Judaism – IMPJ). As goes the Jewish world, so too will those views be reflected in the WZC as a whole, and strong debate on virtually every issue is expected. Resolutions will be presented, debated and voted upon on many cutting-edge issues including the Israeli-Palestinian conflict, settlement growth, Israel’s relationship with world Jewry and vice versa, the status of democracy and religious pluralism in Israel, egalitarian prayer at the Kotel (Western Wall), the religious rights of Israel’s non-Orthodox Jews, the rights of Israel’s LGBT community, and current Israeli policy concerning asylum seekers from Africa and Syria. Many of the resolutions to be presented originated with ARZENU, the International Federation of Reform and Progressive Religious Zionists. Our ARZA delegation, in conjunction with ARZENU (as well as our natural allies in the Israeli and international delegations), is in a strong position to make a significant impact on the future of the World Zionist Organization, which means that we will be working hard to assure the continued growth of democracy, religious pluralism and diversity in the state of Israel for all its citizens, religious streams and those under its control (i.e. Palestinians living in East Jerusalem and the West Bank who are not Israeli citizens). I will file reports from Jerusalem on this blog as the pre-conference deliberations with ARZENU begin on October 18, and upon the commencement of the WZC itself on October 20. Upon my return I will also file a longer report for The Los Angeles Jewish Journal. For those who live in Los Angeles, I invite you to an early morning briefing at Temple Israel of Hollywood upon my return. We will meet on Wednesday morning (8-9 AM), October 28. Note: To understand the mission and action statement of the Association of Reform Zionists of America, see the ARZA Website at http://www.ARZA.org and http://www.arza.org/about-us-our-mission. ARZA, as well as its parent body, the Union for Reform Judaism (URJ), supports a negotiated two-state final resolution of the Israeli-Palestinian conflict as being in Israel’s best interests as a Jewish and secure democratic state. A new poll measuring Israeli attitudes towards that country’s left wing was conducted recently by Molad – The Center for Renewal of Democracy, and its findings are curious, to say the least (Note: this is according to TLV1 The Promised podcast – I have not found reported in the English language this poll, nor does it yet appear on Molad’s website). The poll found that most Israelis consider the left’s diplomatic and security doctrine to have been a failure. From its peak of power and influence during the Rabin years, the left wing’s influence in the Israeli government has declined consistently since the Prime Minister’s assassination, the collapse of the Barak-Clinton Camp David Summit and the second Intifada, and most recently following the failure of the Kerry negotiations. However, when asked if Israelis still support the Clinton Framework that emerged out of the Oslo Peace Process that proposed a 2-state solution, a border between Israel and a future state of Palestine drawn roughly along the pre-1967 armistice lines with land swaps, Palestinian refugee resettlement only in the to-be-established state of Palestine, demilitarization of the West Bank except for a Palestinian police force, and a shared Jerusalem in which both states have their capitals, 46% of Israelis still support it as opposed to 40% that are opposed. When Arab-Israeli citizens were removed from the polling sample to measure only the attitudes of Israeli Jews, 45% supported the Clinton Framework with 40% opposed. When the Clinton Framework was considered in the context of larger multi-lateral agreements including Egypt, Jordan and Saudi Arabia, Israelis favorable ratings increased to 50% and 39% opposed. • 61% do not want Jerusalem divided though they support the Clinton Framework that calls for a shared city. What does not seem to be reflected in the polls is the strong cooperation that has existed in the last several years between Israel’s security forces and the Palestinian Authority that has resulted in a dramatic reduction of Palestinian terrorist attacks against Israelis; nor does the fact that during the two years prior to the outbreak of last summer’s war against Hamas, Hamas had held to a negotiated cease-fire with Israel; nor do Israeli attitudes seem to reflect President Abbas’ commitment to non-violence, though he has been inconsistent. In a recent podcast on TLV1 The Promised (“Peace by the Numbers” – August 27, 2015), journalists Noah Efron, Don Futterman and Allison Kaplan Summer debated what these conflicting statistics mean, what opportunities there may be still to advance a peace process leading to a two-state solution and what is to blame for the inconsistencies. The Molad poll revealed that the issues that have most concerned the Israeli left wing, such as income inequality, peace with the Palestinians, Israel’s relationship with the European Union, and Israel’s diplomatic and economic ties with the West, are not considered particularly important to the right-wing and therefore are not priorities to the current Israeli government, even though these concerns are still of important concern to the majority of Israeli voters. The TLV1 segment addresses all the related substantive issues and considers what dynamics within Israel and among the Palestinians are contributing to the continuation of the status quo, which likely will lead to ongoing violence and war. I have known Brad for 45 years. We were part of a Zionist student group at UC Berkeley, and we recently reconnected at a J Street national conference in Washington, D.C. that he was covering for Haaretz. He was a mensch when I knew him, and he still is. “What I’m about to write will not come easily for me. I used to be one of those people who took issue with the label of apartheid as applied to Israel. I was one of those people who could be counted on to argue that, while the country’s settlement and occupation policies were anti-democratic and brutal and slow-dose suicidal, the word apartheid did not apply. Brad then detailed the un-democratic and harsh Israeli Military Authority policies in the West Bank, the violent turn the settler movement has taken against Palestinians, and the current Israeli government response. He wrote his article in the wake of the recent bombing by Jewish terrorist settlers (allegedly) of a Palestinian home resulting in the murder of an 18-month old toddler, her father and serious burns suffered by other family members. I believe the point of Brad’s article is that Israelis are ignoring the inhumane West Bank policies of its government. He wanted to shock people into paying attention. I emailed the host of TLV1’s “The Promised” podcast, Noah Efron. This weekly hour-long program is among the most thoughtful conversations by Israelis in the English language on Israeli politics, culture and the Jewish world. Noah Efron is a smart, funny and passionate Israeli, originally from the states, whose day job is being a scientist and Professor at Israel’s Bar Ilan University. His two fellow commentators originally hail from the US as well and include Don Futterman, the Director of the Moriah Foundation and a writer for Haaretz, and Allison Kaplan Sommer, a journalist who is published in all the world’s leading English language newspapers and periodicals. Listening to these three think out-loud is a weekly pleasure that I eagerly anticipate. This segment was exactly what I was looking for – a thoughtful critique of both Israel’s West Bank occupation and whether it is or isn’t Apartheid. All three commentators said it is NOT, but that Israel is on the road to Apartheid.